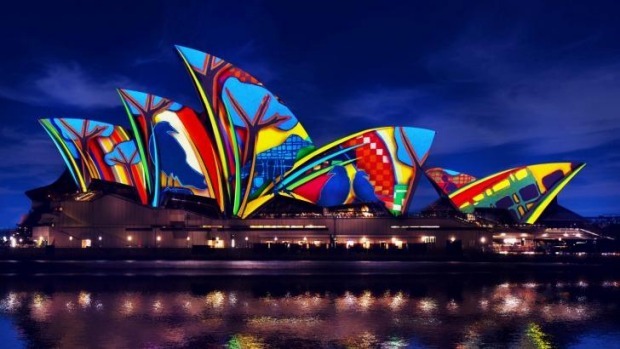 Vivid Sydney will light up the city from this weekend until June 18, showcasing some of the city's best minds and artistic talents. Now in its eighth year, the festival stretches from Sydney Harbour to Carriageworks and Taronga Zoo, with a slew of tasty food installations to match. From digital burger battles to high-end chefs collaborating with break-out creative talents, the menu of dining options is set to shine almost as bright as the electric light shows. This year, the iconic (and free) Light Walk stretches from the Royal Botanic Gardens to Walsh Bay. Take a small detour and treat Bulletin Place (10-14 Bulletin Place, Sydney) as a halfway pitstop with excellent refreshments. An award-winning whisky cocktail should help warm your cockles and ward off Sydney's pre-winter chills. The rooftop bar of Glenmore Hotel (96 Cumberland St, The Rocks), is also an ideal refuelling station, with finger lickin' sticky hot wings and grilled cheese kransky hot dogs to snack on while taking in the sweeping harbour views. Once you reach the end point of Walsh Bay, you'll want something more hearty. Consider a feast of steaming mud crab xiao​ long bao and prawn wontons in chicken soup from Lotus Restaurant, or a bowl of hearty pappardelle folded with ragu and a glass of grippy shiraz from the neighbouring Fratelli Fresh (both on Hickson Road, Dawes Point). Fancy something a little more curated? 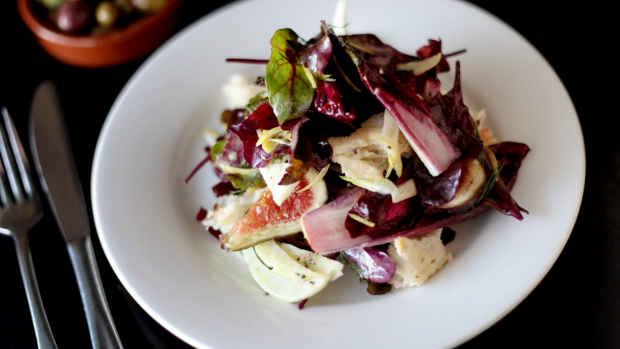 Vivid's associated venues are also offering a veritable feast of options. The Sydney Opera House's restaurants and dining option will nod to Bennelong Point's Indigenous history for Vivid, drawing on native and traditional flavours to amp up usual offerings. A playful Bennelong Billy will join Peter Gilmore's Australian-produce focused menu at the upscale Bennelong, pairing strawberry gum, quandong liquor and river mint with rum in a colourful cocktail. 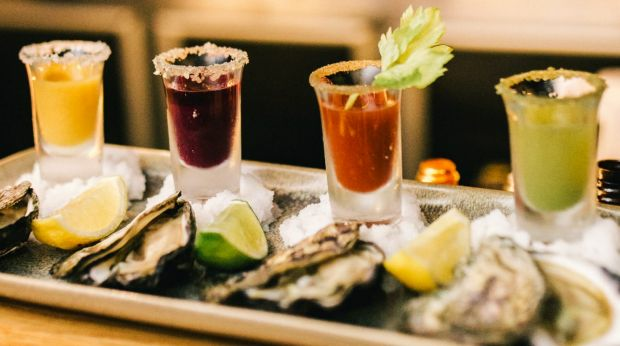 At the Opera Bar, a set of four shooters, flavoured with smoked macadamia nuts, juicy finger limes and native berries, are paired with freshly shucked oysters. The 8Bits+Bytes Burger Activation at Martin Place takes the long-raging debate over Sydney's best burger up a notch. Five contenders, including favourites Mary's and Milk Bar by Cafe Ish, will offer up their best burgs to the public, who can vote via hashtag, with a 30-metre old-school vintage arcade gaming-style display correlating real-time digital votes. The burger battlers will design custom menu items for the events, including a HACKRoulette from Bangbang, loaded with chilli con carne, umami sauce and a shot of pickle juice. Sweet fiends should seek out a tiramisu-inspired dessert burger, courtesy of a collaboration between N2 Extreme Gelato, Black Star Pastry and Little Marionette. Just don't forget to take a breather and nerd out over the food-themed digital displays, too. 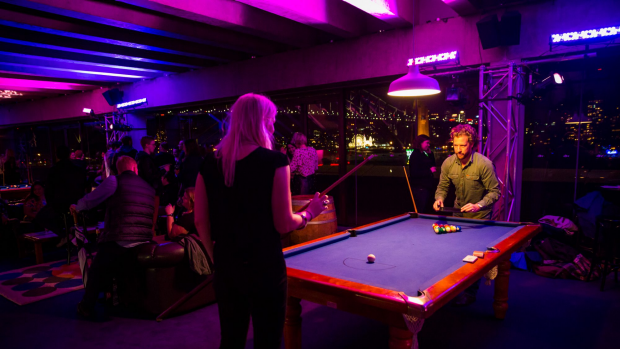 Play tribute to Prince by raising a glass to the music god in the Deep Purple Pool Hall, a ten-night only activation in the concert hall of Sydney Opera House's Northern Foyers. The pop-up is a collaboration between the tequila-slinging team behind Tio's Cerveceria and Cliff Dive and Aria Catering, with eats such as jalapeno gel-studded ocean trout ceviche, spiced lamb quesadilla and tortilla chips with romesco dip (all $16 each). Expect riffs on classic cocktails, such as watermelon and rosewater spiked margaritas, or a tropical Big Easy, mixing rum with grapefruit, pomegranate and guava. After exploring from Barangaroo to Bennelong Point, park your gang at Dawes Point Park for a viewing vantage point and bites from nine of the city's best food trucks. Eat Art Truck, The Night Hawk Diner, Veggie Patch Van and more will takes turns to sling supper at the point, with a rotating schedule between there and the Sydney Opera House. Carriageworks will play home to Sydney Table, a series of one-off dinners pairing chefs with artists and photographers, held as part of the festival. Pinbone's Mike Eggert will join forces with illustrator Anna Vu (known for her excellent Good Food Crap Drawing project), ACME's Mitch Orr will work with dancer Amrita Hepi, and Ester's Mat Lindsay collaborates with ceramicist Ion Fukazawa. Carriageworks Farmers Market creative director Mike McEnearney will also curate The Night Market (held from 5-10pm on June 4 and 18), showcasing more than 200 producers and wine makers from across the state. Factory Design District is a three-day exhibition as part of Vivid Ideas, showcasing designers and makers, including food businesses. A handful of eats are on offer. Chef O Tama Carey will serve Sri Lankan hoppers laden with black mutton curry and fresh coconut sambal, while Rising Sun Workshop's menu includes bahn mi stuffed with pork and lemongrass terrine or black pepper tofu and sherry-soy pickles, plus the usual trimmings. Ward off the oncoming winter chills with chicken noodle soup from Continental Deli, or get fresh with a seasonal salad from Bloodwood, paired with tipples from Young Henrys and Urban Winery. On June 3, the producers and chefs will come together to host Slow Burn Supper Club, a five-course degustation with paired drinks, live music and discussions ($120pp).